Zaim details his personal observations at an UndiMsia! Gameshop. During the UndiMsia! #IdolaDemokrasi GameShop at KDU University College (Section 13, PJ) on Saturday 18 February, I was sharing my notes with LoyarBurok supremo Edmund Bon about the GameShop. Edmund saw my notes and said that he would be interested in looking at it. After painstakingly transferring the notes on my notebook to a Word document (no easy task! ), I came up with a personal report on the GameShop. Edmund told me that I should post this up on the LoyarBurok blawg. While it’s rather dry and monotonous, it’s a blow-by-blow account of the KDU GameShop. I hope it goes some way in helping understanding the #IdolaDemokrasi GameShop better! The participants were asked to come up with few ground rules. 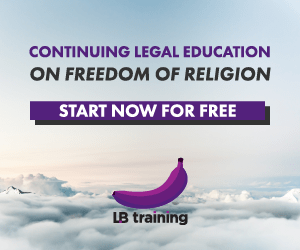 First module: Where do you stand? As an icebreaker, every participant to introduce themselves to the crowd. The participants were then given an opportunity to briefly justify their respective positions. Purpose: To encourage the participants to take a position on contentious issues while respecting dissenting views. Imagine the world is about to end and you must leave in a spaceship to another planet. What are the five things you will bring with you to the new planet? First, each participant were given a piece of paper and asked to list the 5 items or people. Then, the facilitators divided the participants into groups of two and instructed all the groups to discuss the same scenario together and list 5 items. The participants then divided evenly into bigger groups depending on the size of the crowd. 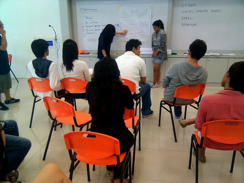 Finally, the group would elect a representative to present the ‘spaceship’ scenario to the participants. Purpose: The facilitators pointed out the purpose of the ‘spaceship’ scenario was to highlight the difficulty of consensus building in a democracy. 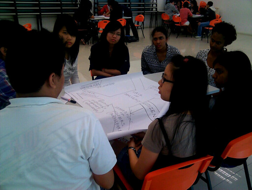 The facilitators were asked to mention the main issues Malaysia is facing. The facilitators listed down the issues mentioned on the board. Upon listing the various issues, the facilitators described the problem tree analysis and drew a diagram of it to illustrate to the participants. Then the facilitators divided all the participants evenly into big groups provided with mahjong paper, and told to draw a problem tree analysis based on the issues they selected. After adequate time has been provided, the group were to elect a representative to present to all the participants. The mahjong papers were then posted up on the wall. The facilitators asserted that the root cause of the issues listed is lack of democracy in Malaysia. 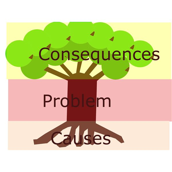 Purpose: From my understanding, the problem tree analysis allows the participants to discover the root causes of the issues in a democratic framework. It will compel the participants to focus on the root causes in a holistic view. 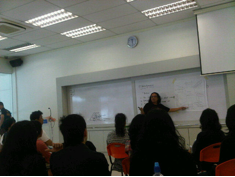 The facilitators utilised the boards to illustrate the bigger picture of democracy in Malaysia through crowd-sourcing. Demography – population size, racial breakdown, religions, gender, age, classes). Government; the separation of powers – the three branches of government: legislative, executive, judiciary. Public-private divide – media, NGOs. Appointment of important government officials – judges, senators, cabinet members. From this, the facilitators highlighted the problem of representative democracy, which Malaysia is modelled on. In Malaysia, election is held every five years and nothing much happens in between the elections. Hasbee advocated for direct democracy, whereby citizens in a state would have be directly involved in making the decisions on the premise that every decision affects everybody. Hence, everybody should be given a say in the decision-making process. Purpose: The participants will be able to understand the many issues in context of a bigger picture – the Malaysian political system and the underlying power relations between its actors. Once the participants understand this, the facilitators are able to convince the participants that the need for action starts with him or her. Edmund emphasises that talking about change without action is no change at all, and called for Citizen Action – for everyday rakyat to resolve the issues directly and more effectively by crowd-sourcing the solution. 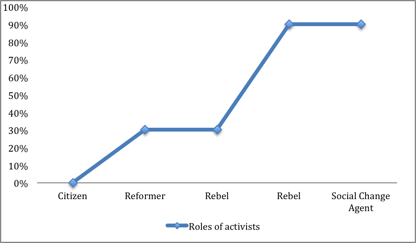 Then, Edmund proceeds to describe the four roles of activists in society as provided in the hand-out. 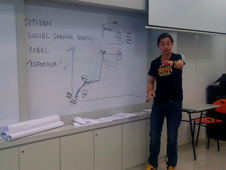 To illustrate the 8 stages of a social change movement, he use the example of the Bersih 2.0 movement in addressing the problem of electoral fraud in Malaysia. Edmund drew a graph (below) to depict the stages of the Bersih 2.0 movement. The facilitators instructed the participants to return to their original groups of 5 to ideate solutions (to the issues they discussed) based on Bill Moyer’s concepts and the 198 methods of nonviolent action. Each group were given mahjong papers and asked to elect a representative to present their plan for Citizen Action. Edmund mentioned that the three groups were to compete to be IdolaDemokrasi (inspired by American Idol) upon a vote of the participants. After each presentation, the representatives were closely scrutinised by the facilitators primarily in terms of CSI. The winning team of IdolaDemokrasi will be tasked to form a Youth Action Group or YAG to implement their plan. The winner of IdolaDemokrasi was the group on the education system and will presumably be responsible to set up a KDU YAG. Edmund ends the GameShop by encouraging all the participants to help set up the YAG and join UndiMsia! chats every Saturday morning at the Pusat Rakyat LoyarBurok in Bangsar. Zaim Mohzani is a Politics and Law student in the Melbourne campus of Monash University. He is currently the Deputy Chairperson for the Malaysian Students’ Council of Australia (MASCA) in the state of Victoria. As his passion is in promoting intellectual discourse, he is leading MASCA’s intellectual arm, the Malaysian Aspiration Program (www.malaysianaspiration.com) which has partnered with UndiMsia! to create the first Youth Action Group (YAG) in Australia. He tweets from @Zaim90. Behind the writer’s outspoken and, at times, brash behaviour, he only aspires for a better Malaysia – a place where we all can call home. Posted on 29 February 2012. You can follow any responses to this entry through the RSS 2.0. Read more articles posted by Zaim Mohzani. I was going to write this but you beat me to it.